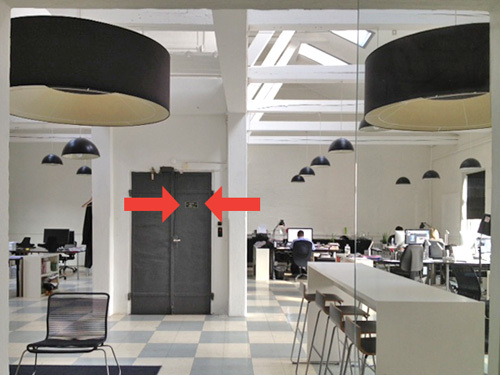 In the shared creative office space where I work, there is an old freight elevator in the middle of the room. It is surrounded by 30-foot peaked ceilings, raw ceiling beams, a view into an inner-courtyard typical of Copenhagen buildings, and all the stark and minimalistic Danish interior decorating trappings such as black and white lights, decor and social areas. The elevator isn’t used more than once in a blue moon to haul something heavy up to the top floor – I don’t think anybody really notices it. But when I enter the light-filled room and near the elevator door on the the way to my desk each day I’m presented with this small sign, which for a second causes me pause. Gather round all you sinners, all you thieves – I’m starting a new side business selling tickets to heaven. More details to follow once I figure out the logistics. But if I institute a price point that one might expect on such a service, I should be able to retire early. HAHAHAHA! I have looked at that sign for years and never thought about it! 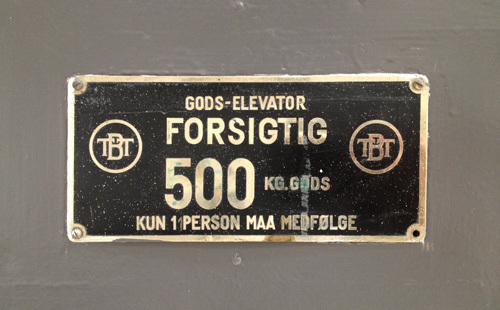 Regarding your new service the big questions is: Is the God’s Elevator a one way ride or…? I’m not sure if I should sell round-trip tickets or not. And from our office the elevator only technically travels downward. But these are minor details. Love this! What a find. Also, thanks for sharing a photo of your workplace. sign up for a somewhat-monthly newsletter showcasing recent work and side projects.